If given the option to live in a Theme Park, I would move to Epcot this afternoon. My family first visited then EPCOT Center in July 1983, and I was immediately hooked (perhaps it was the dream of tomorrow, seeing “John Hench purple” everywhere, or that Figment of Imagination). Of the things I collect, I love EPCOT Center merchandise from pre-opening to around 1985. After reading the many incredible memories shared in “The Florida Project” post, I thought a follow-up post about my favorite park was in order. From the start, EPCOT Center merchandise was different. Most of the opening merchandise did not feature well-known Walt Disney World characters (they wouldn’t arrive until the mid-1980s). There were, however, several items featuring characters created for the park like Dreamfinder, Figment and Kitchen Kabaret characters from the former Land Pavilion show. 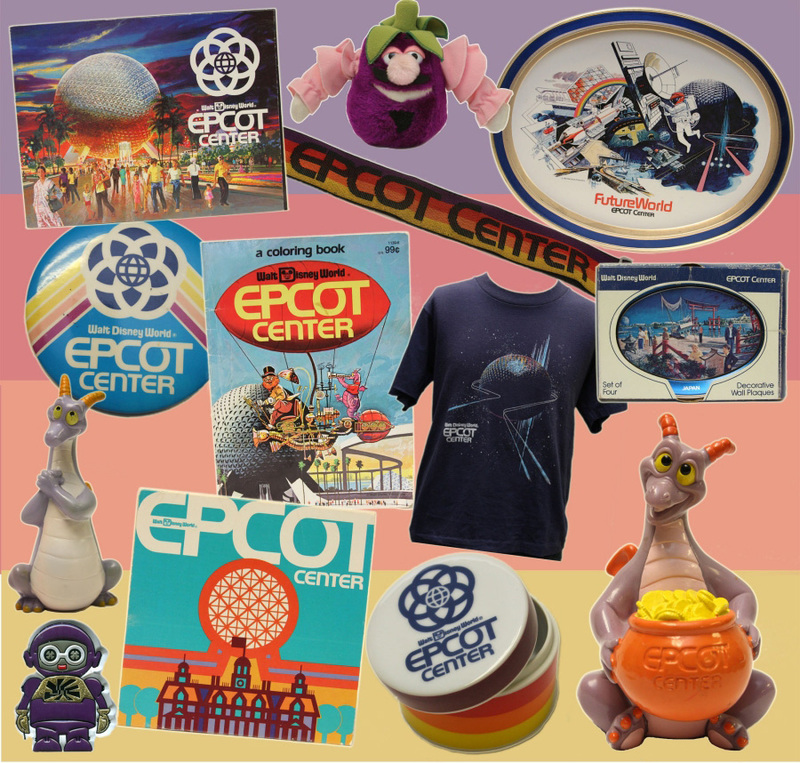 Most items from 1982-1985 featured the EPCOT Center logo (”a graphic representation of the park’s philosophy,” according to Marty Sklar, long-time Imagineer and Disney Legend) along with four colors – purple, red, orange and yellow. Those colors and logo were found on everything from coffee mugs to hats to tee-shirts to even a camera strap which I still use today (I “borrowed” it from my father). I have three favorite items in my collection. 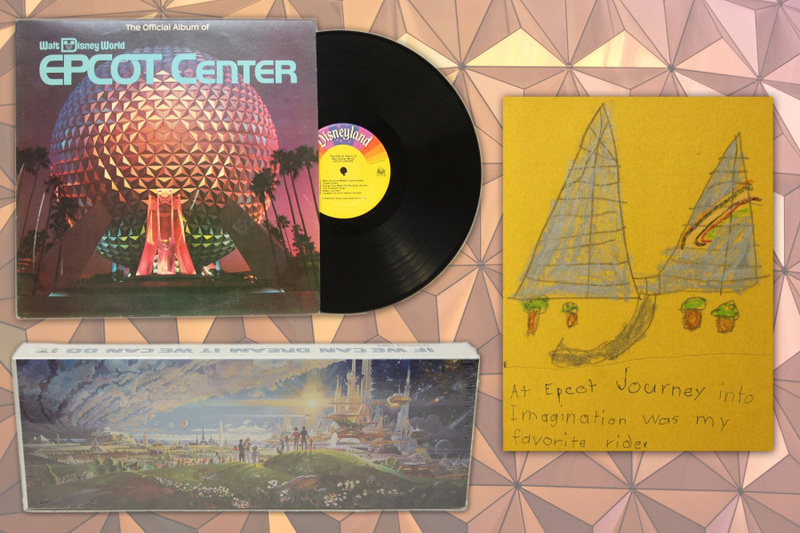 The first is the official album of EPCOT Center. After our first visit in 1983, my sister and I performed an interpretative dance for our parents while playing the record (no, I don’t have video). The next is a puzzle from Horizons (my all-time favorite pavilion) with artwork by Robert McCall once featured at the exit of the attraction. I nearly fainted when I found it in a local antique shop still in shrink wrap. My last beloved item is not merchandise but it is a great memory. My mother and I made a book after my first Disney trip, and above is a drawing of my then favorite pavilion, Journey Into Imagination (Horizons didn’t open until October 1983). I’m sure you can see why I didn’t pursue an art career. 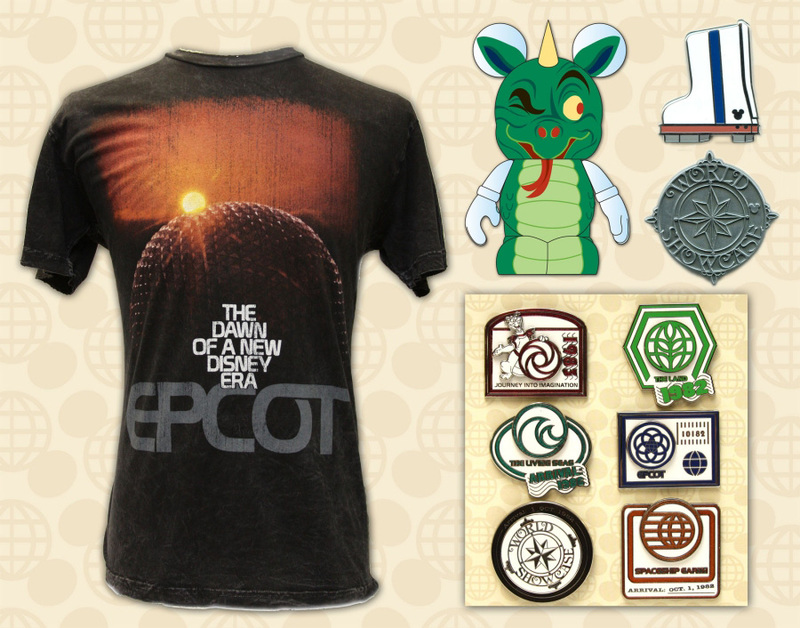 Luckily, that spirit of EPCOT Center still lives today in Disney Theme Park Merchandise. For the 25th Anniversary of the Park, Walt Disney World has introduced several retro-inspired shirts. They have proved quite popular with guests so a new shirt is arriving in locations (pictured above). They have also created a variety of Disney pins, like the passport set being released on December 16. There will be two new Hidden Mickey pins next year including the infamous boot from the Space Colony scene in Horizons. Finally, I have a sneak preview of a figure from a future Vinylmation Park series (do you recognize it? ).